butter murukku - south indian style murukku made with butter & rice flour. butter murukku recipe with step by step photos – simple, easy and tasty recipe of butter murukku. 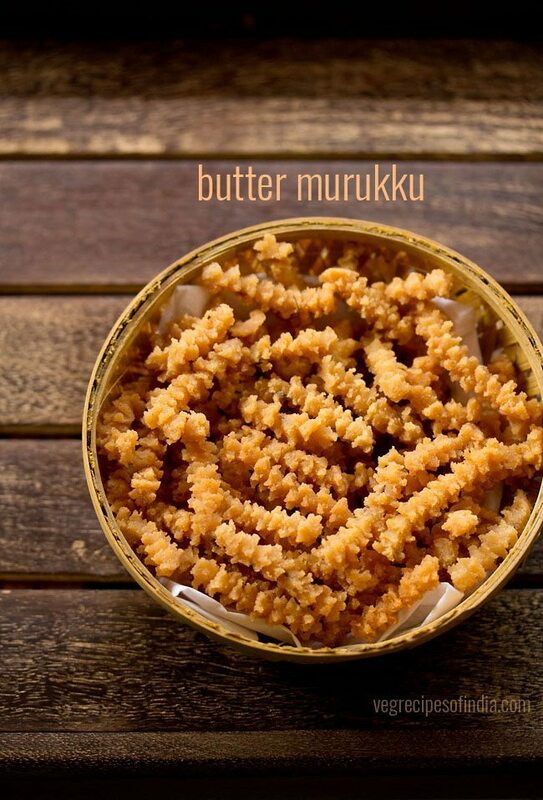 butter murukku is one of our favorite snack. this recipe of butter murrukku was shared with me by durga aunty, who has already shared some fab south indian recipes before like curd rice, pongal and methi dosa. 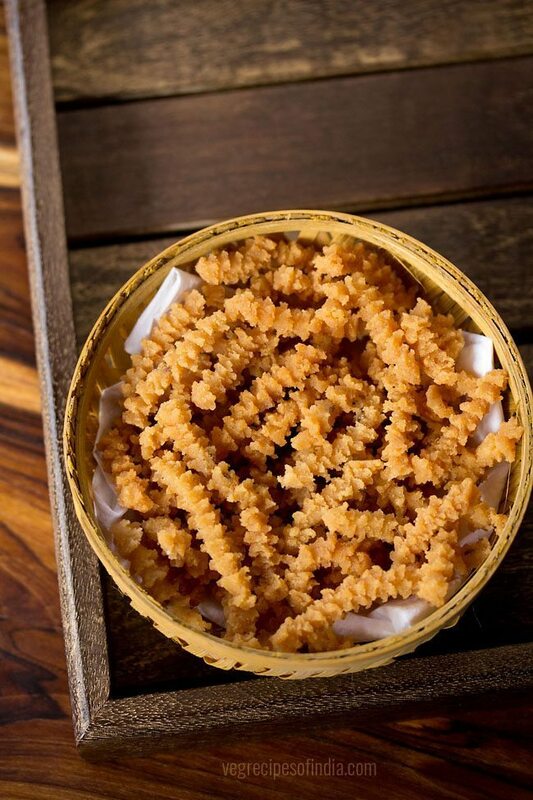 murukku is the south indian variation of the chakli that is made in maharashtra and gujarat. 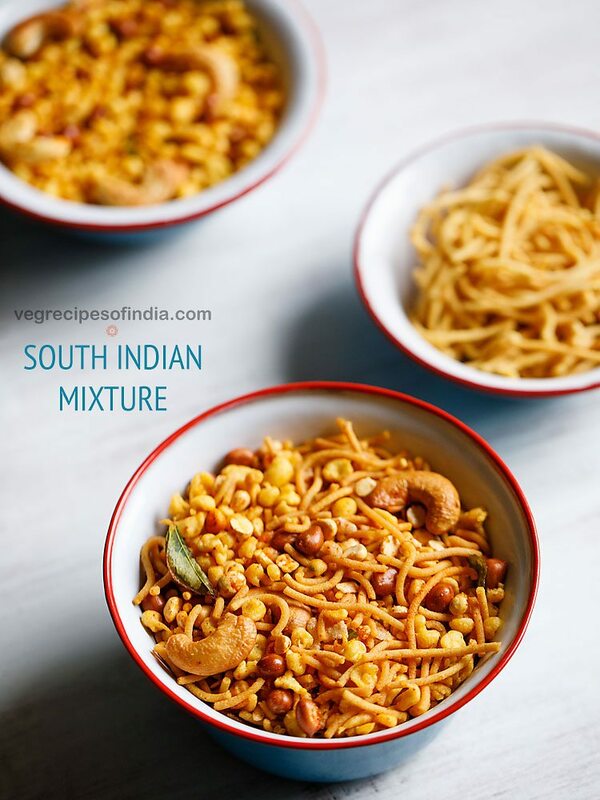 while the basic method remains the same, there are many variations of murukku made with different ingredients and their proportions. 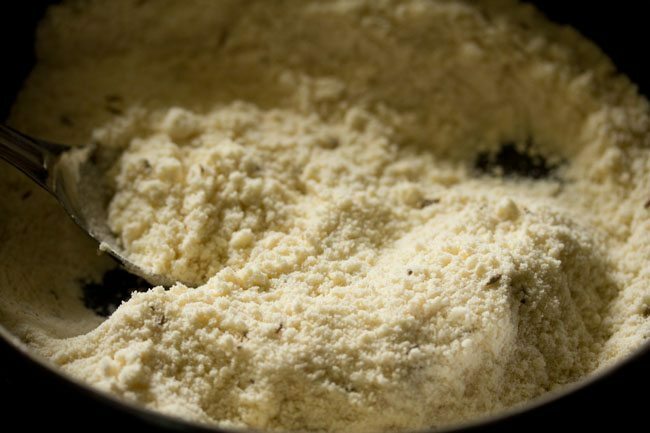 the butter murukku recipe shared here is made from rice flour, roasted chana dal flour and besan. 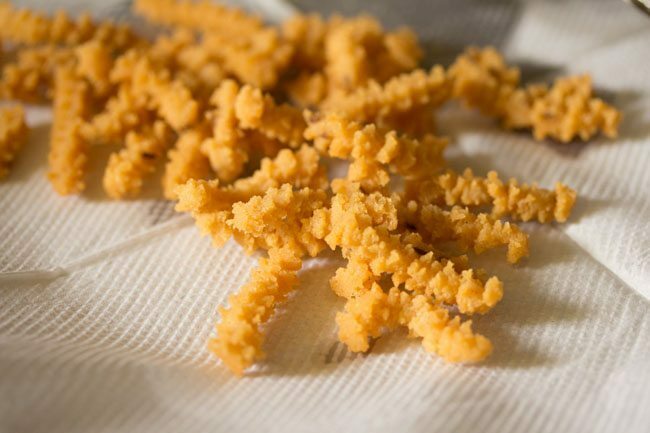 this butter chakli recipe is very easy. 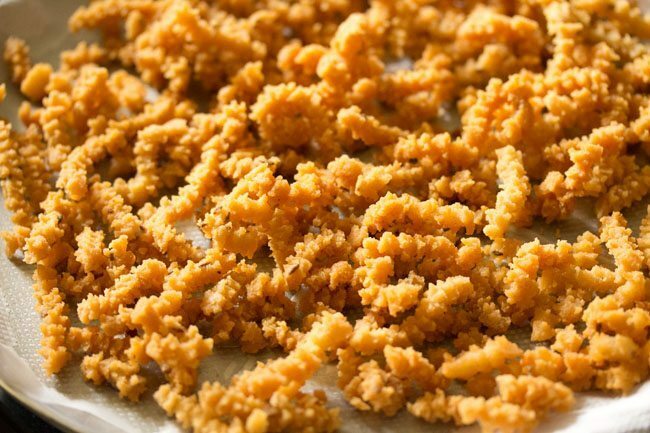 you will need a chakli maker or murukku press to prepare these savory snacks. i made the murukku twice. first time did not take pics. so then took pics the second time when i made them. you can easily double the recipe. 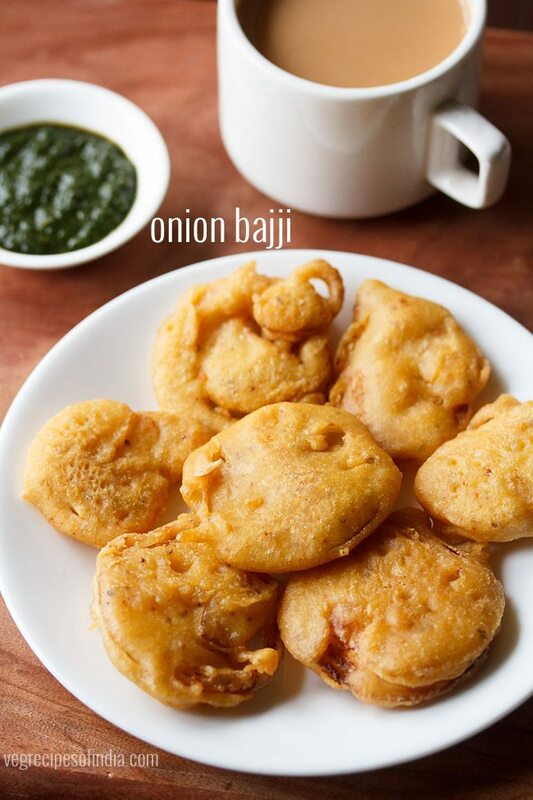 take rice flour, besan and roasted chana dal flour in a mixing bowl or pan. for roasted chana dal flour, grind 1 tablespoon roasted chana dal in a small grinder or coffee grinder till fine. then seive it directly in the pan containing rice flour and besan. add 2 tablespoons salted butter. you can also use unsalted butter. add 1/3 teaspoon salt or as per taste. 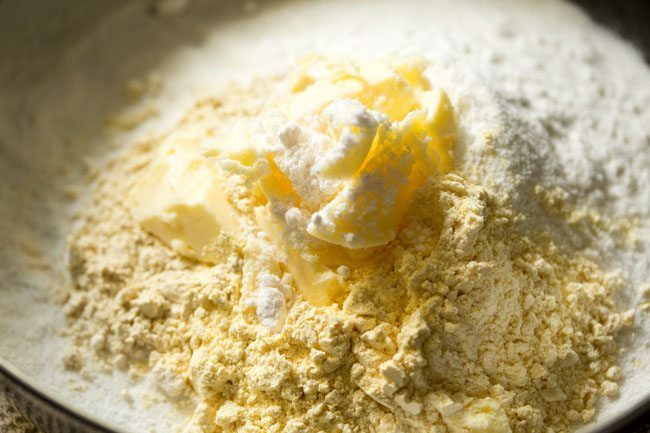 now mix everything and rub the butter into the flour with your fingertips till you get a breadcrumb like texture in the flour mixture. add 1/2 teaspoon cumin seeds and 1/2 teaspoon hing. mix very well with a spoon or with your hands. now add water in parts. begin to mix and knead the flour. add water in parts and knead to a smooth soft dough. i first added 4 tablespoons water and later added 5 tablespoons. depending on the quality of flours, you can add less or more water. 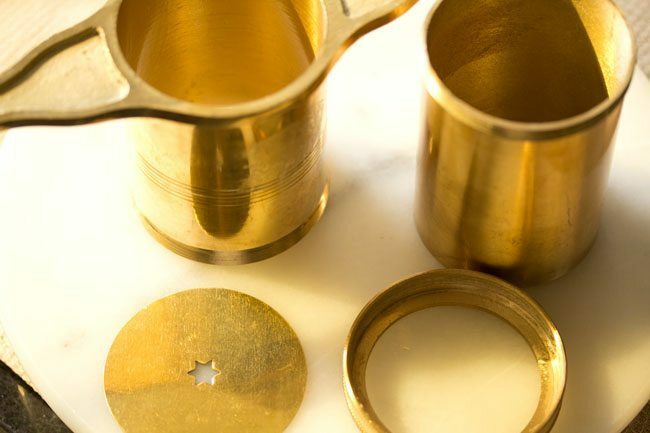 use the star nozzle lid for preparing murukku. apply some water in the chakli/murukku maker. 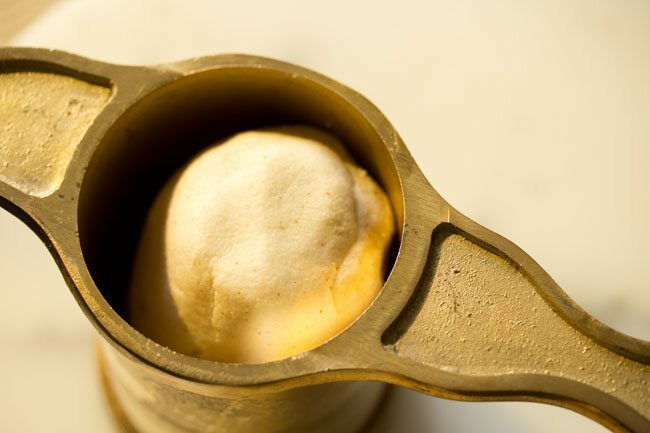 take a portion of the murukku dough and place it inside the murukku maker. let the oil become medium hot. check the oil temperature by adding a small piece of the dough. if the dough comes up gradually and steadily on top, the oil is hot enough to fry. if it comes up too quickly, then oil is too hot. if it settles down at bottom of kadai or comes up very slowly, the oil is not hot. when the oil is hot enough, press holding the chakli maker directly on top of the oil and let the murukku directly fall in the oil. do not over crowd the kadai with murukku. add as much as needed without overcrowding the kadai. fry till the murukku are half done or have become slightly crisp. after adding the murukku, do not touch them immediately with the slotted spoon as they break. they need to become slightly crisp first and then you can turn them over with the slotted spoon. turn over the butter murukku with a slotted spoon, so that they get fried evenly. keep on turning to get them evenly golden. 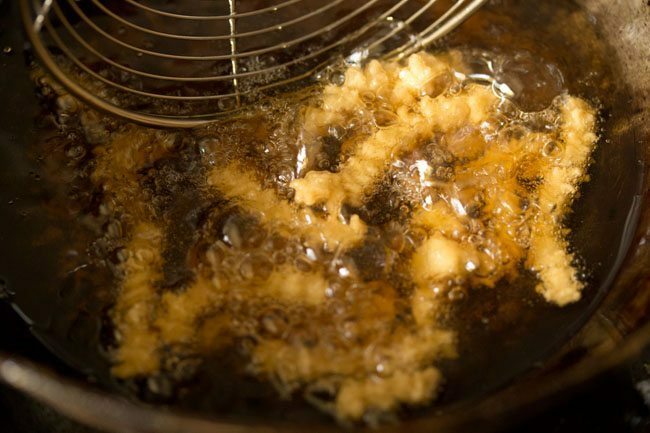 fry them till the sizzling in the oil reduces and the butter murukku becomes golden. remove with a slotted spoon and drain butter murukku on kitchen paper towels to remove excess oil. in the same way fry all the murukku this way in batches. 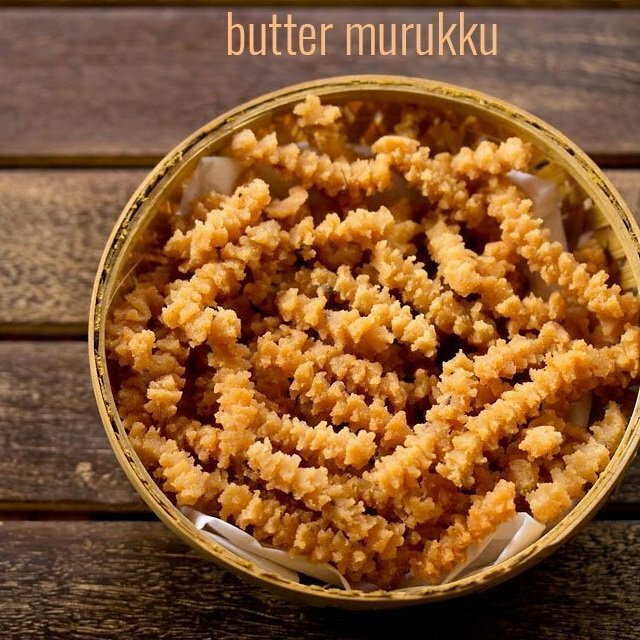 when cooled, store butter murukku in an air-tight box or jar. 1. take 1 cup or 150 grams rice flour, 1 tablespoon roasted chana dal flour and 2 tablespoons besan (gram flour) in a mixing bowl. for roasted chana dal flour, grind 1 tablespoon roasted chana dal in a small grinder or coffee grinder till fine. then seive it directly in the pan containing rice flour and besan. 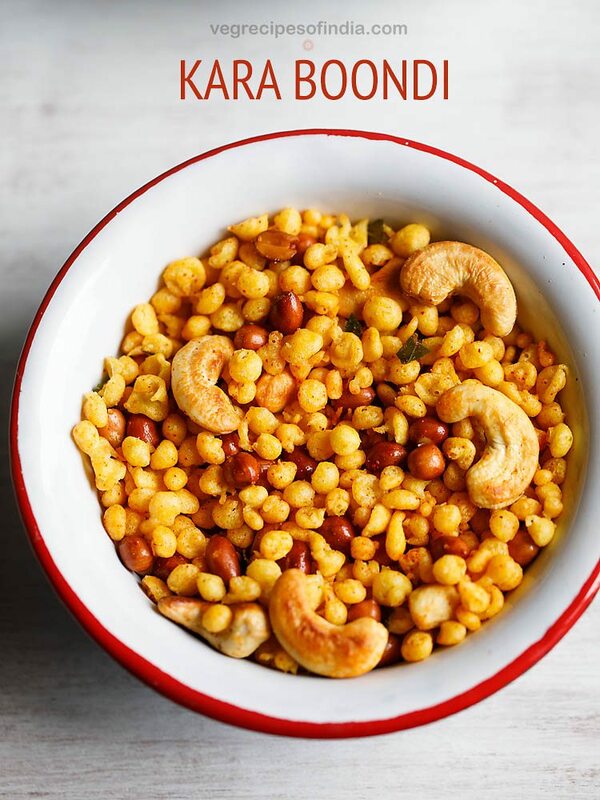 if you plan to use roasted chana dal flour for preparing more snacks, then you can grind roasted chana in more quantities too. if you do not have roasted chana dal or roasted chana dal flour, then just skip them and overall add 3 tablespoons besan. 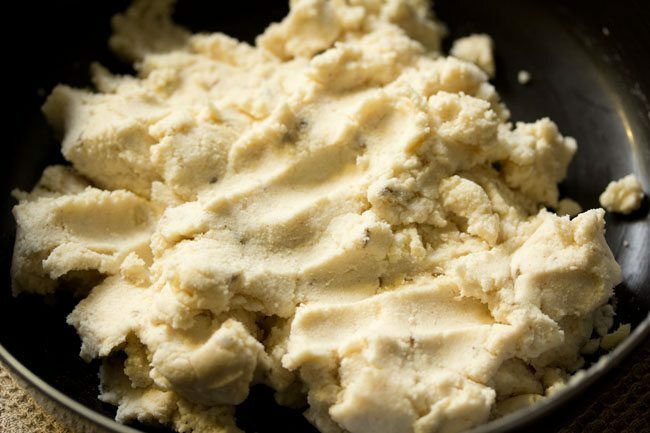 2. add 2 tablespoons salted butter. you can also add unsalted butter. 3. add ⅓ teaspoon salt. 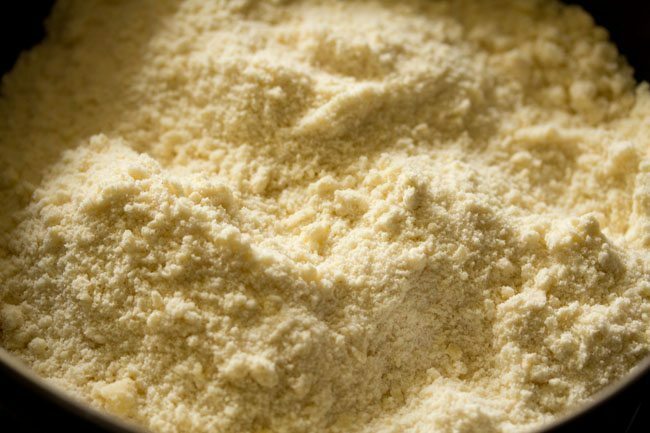 4. now mix everything and rub the butter into the flour with your fingertips till you get a breadcrumb like texture in the flour mixture. 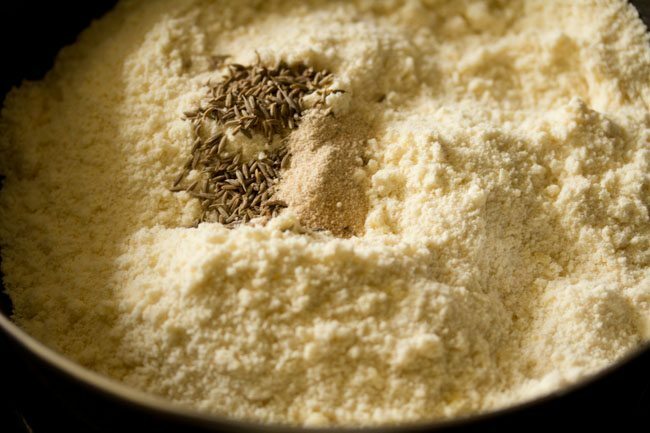 5. add ½ teaspoon cumin seeds and ½ teaspoon hing. 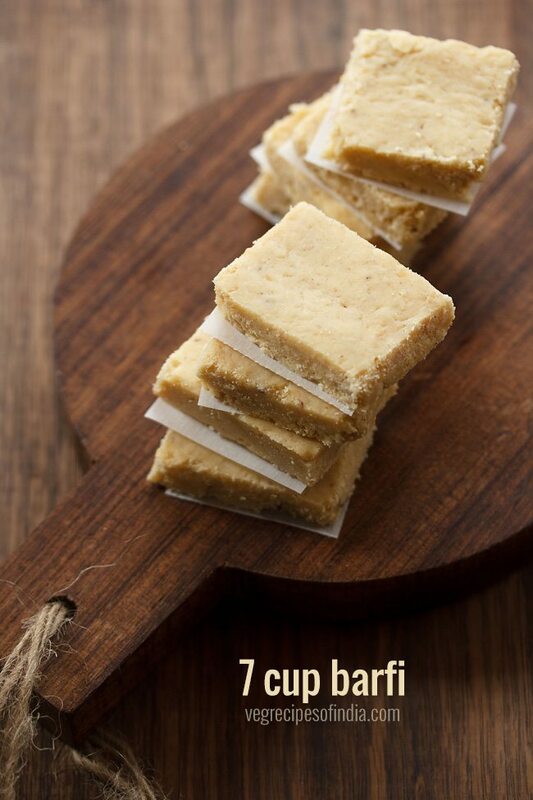 6. mix very well with a spoon or with your hands. 7. now add water in parts. 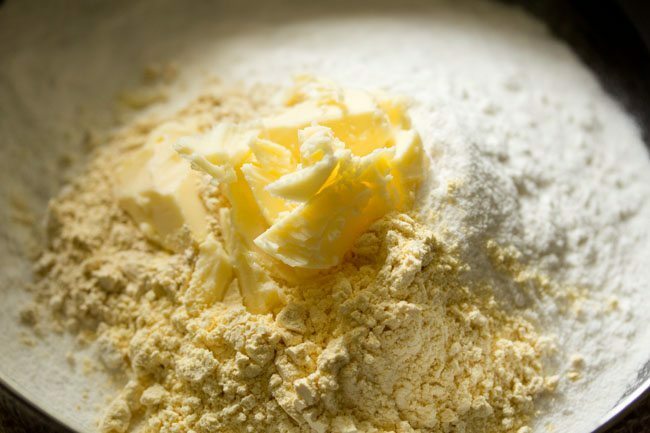 8. begin to mix and knead the flour. 9. add water in parts and knead to a smooth soft dough. i first added 4 tablespoons water and later added 5 tablespoons. 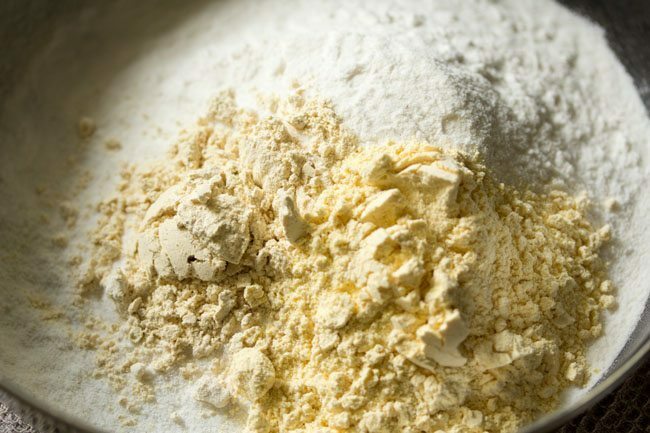 depending on the quality of flours, you can add less or more water. 10. use the star nozzle lid for preparing murukku. apply some water in the chakli/murukku maker. 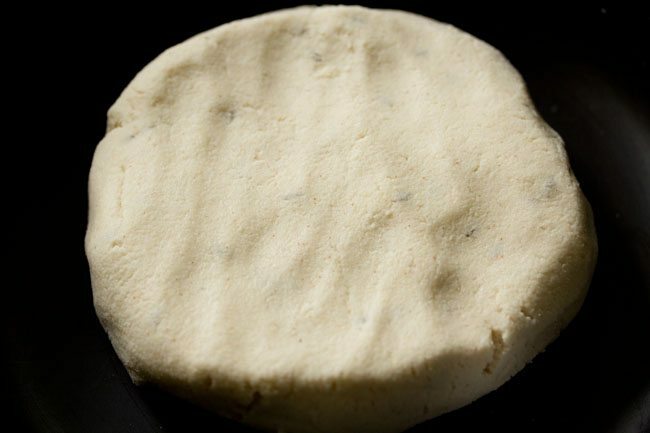 11. take a portion of the murukku dough and place it inside the murukku maker. 12. heat oil for deep frying in a kadai or pan. let the oil become medium hot. check the oil temperature by adding a small piece of the dough. 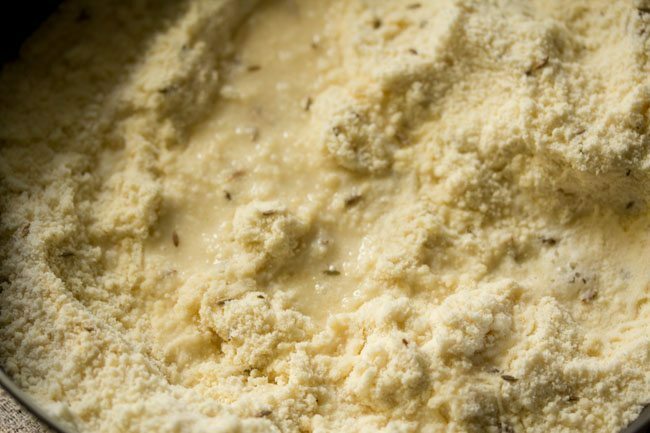 if the dough comes up gradually and steadily on top, the oil is hot enough to fry. if it comes up too quickly, then oil is too hot. if it settles down at bottom of kadai or comes up very slowly, the oil is not hot enough. remove the fried piece and check the texture. follow the tips mentioned below. 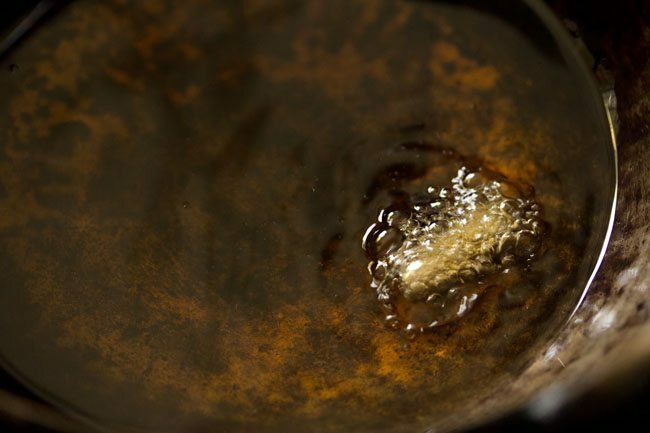 tip 1: if the murukku breaks in the oil, the dough is slightly dry. add a few teaspoons of water. mix very well and knead the dough again. tip 2: if you do not get a proper shape, then this means that the dough has become too moist. add some rice flour and mix well. tip 3: taste the murukku piece and if it feels dense or hard, then add 1 to 2 teaspoon more of butter. mix very well and knead again. 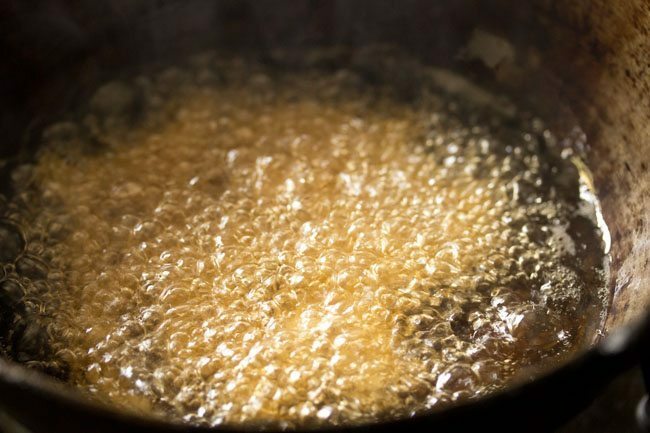 tip 4: if the murukku looks very oil and has absorbed too much of oil, then add a few teaspoons of rice flour and mix again. this happens if too much fat has gone in the dough. 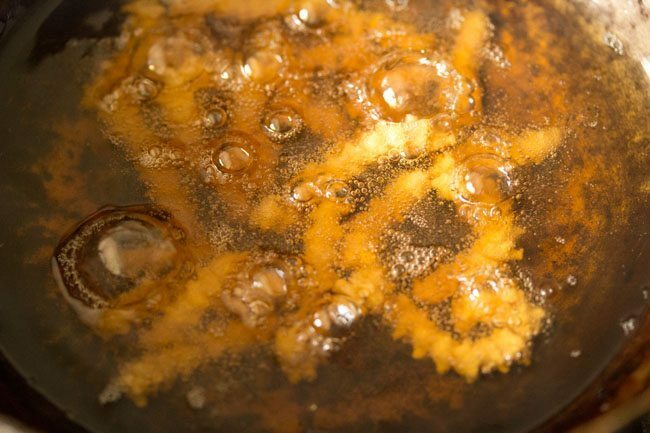 13. when the oil is hot enough, press holding the chakli maker directly on top of the oil and let the murukku directly fall in the oil. do not over crowd the kadai with murukku. add as much as needed without overcrowding the kadai. 14. fry till the murukku are half done or have become slightly crisp. after adding the murukku, do not touch them immediately with the slotted spoon as they break. they need to become slightly crisp first and then you can turn them over with the slotted spoon. 15. turn over the murukku with a slotted spoon, so that they get fried evenly. 16. keep on turning to get them evenly golden. 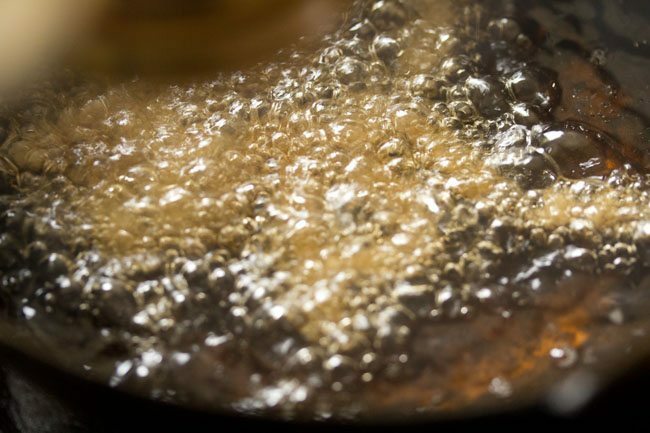 fry butter murukku till the sizzling in the oil reduces and the murukku become golden. 17. remove butter murukku with a slotted spoon. 18. drain murukku on kitchen paper towels to remove excess oil. 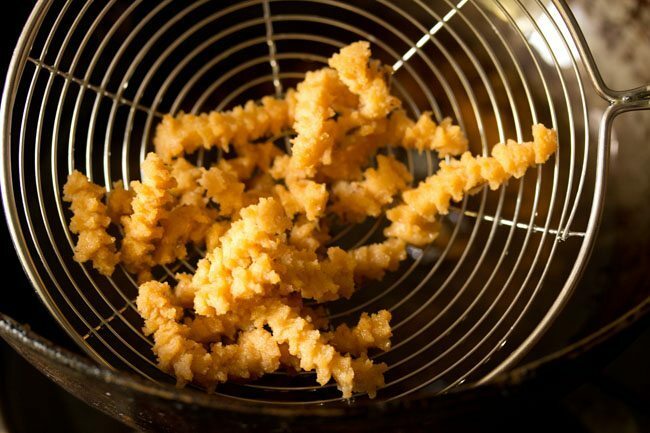 19. in the same way fry all the butter chakli this way in batches. 20. when cooled, store butter murukku in an air-tight box or jar. 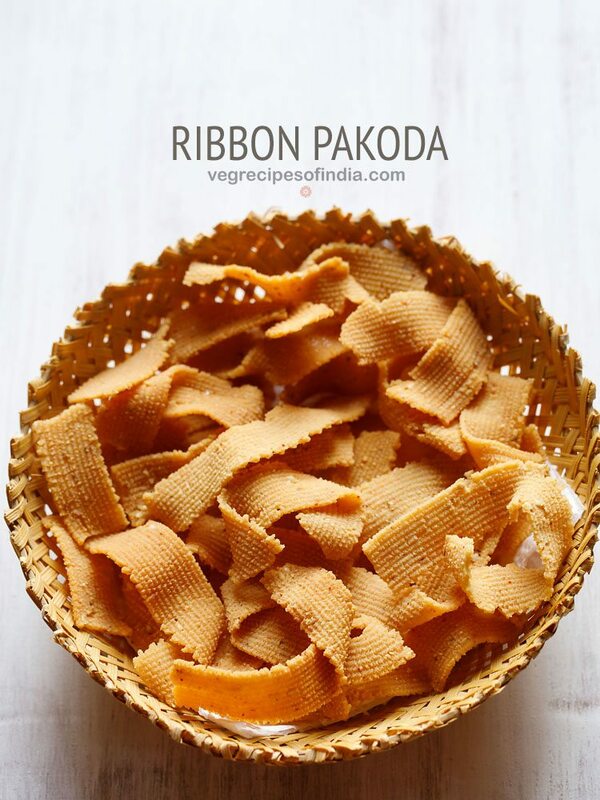 serve butter murukku as festive snack or a tea time snack. For 1kg butter murukku…how much ingredients taken??? increase all the recipe ingredients by 5 times for 1 kg butter murukku. may i add kalonji seeds or nigella seeds instead of cumin seeds?? you can add either. the one i added was chilled.